This month’s reading for the Housing Market Index maintained by the National Association of Home Builders and Wells Fargo: a tantalizingly weak 14. Last month’s post on homebuilder sentiment reserved judgment on whether the big drop in sentiment from 22 in May to 17 in June suggested another big leg down for housing. That decline was big, but could have been a temporary, knee-jerk reaction to the end of the $8,000 government handout program. When times got really bad in fall 2008 to spring 2009, the index collapsed from 14 to 9 and bounced around in the single digits. The HMI has now broken below 15, but only barely. Meanwhile, homebuilder stocks have rebounded with the broader stock market. If real estate sales stabilize and the stock market holds up, the sentiment index should avoid another meltdown. If you’re in the market for a home in Miami or Coral Gables, the HMI may not be directly relevant. So far, real estate sales in Miami and Coral Gables have bucked the national trend and held up well despite the expiration of the $8,000 tax credit. But consider it a canary in the coal mine. If it breaks down further from here, the housing sector and the broader economy might be undergoing another leg down. And Miami and Coral Gables are not likely to gain solid footing as long as the rest of the nation is on its heels. Note : Data for new home sales actually measure contract signings, not closings. 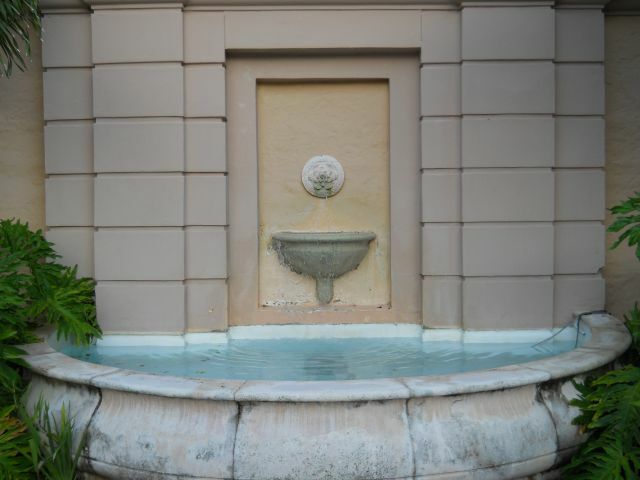 Wall fountain in courtyard of Biltmore Hotel in Coral Gables. Evidence has mounted in recent months of a second leg down in housing and a possible double-dip recession in the broader economy. The problem, ultimately, is that there is really no way out for a people who have gorged themselves on debt. Once you’ve reached the point where you can no longer spend today another dollar that you planned to get tomorrow, it takes a long time to wring out all the excess borrowing. Debt is like hydraulic power. Banks and other lenders take one dollar and lend it 9 times over, or in the case of some failed Wall Street institutions, 30 times over. Government agencies (Fannie Mae, Freddie Mac) and yield-hungry investors who take the loans off the institutions’ books absorb the flow of debt and thus free up the lenders to create more. Eventually, a peak is reached as the most speculative drop of borrowed money is pushed through the system. As borrowing begins to recede, asset values fall, and borrowers, lenders and investors vanish. Real estate can make you rich. There is nothing more beautiful than paying 5 times your income for a house with almost no money down, and seeing its value go up 10% a year. That’s like getting a 50% raise — with 10% annual compounding on top of it. But real estate can also make you poor. There is nothing more destructive of your wealth than buying a depreciating asset with borrowed money. So where are we in this cycle? Previous posts have explained that real estate prices usually fall for about 4 years from the time they really begin declining to the time they reach an ultimate low. 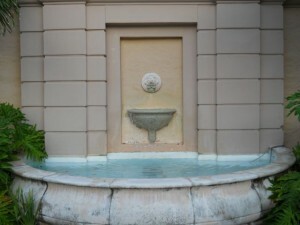 In Miami and Coral Gables, real estate prices did not begin declining until about the beginning of 2007, which suggested that the enthusiasm of the past year was premature. And this is not a typical downturn. Real estate was far more overvalued and overbuilt than in typical cycles. In the broader economy, we are arguably in a depression masked by extreme government intervention. The government and the financial-realty complex turned a firehose of money on the decline in real estate values, and the most we can say is that prices stopped collapsing. 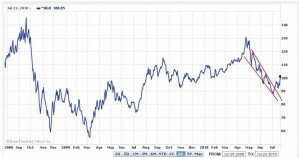 There is less pressure in that firehose now, and not only have prices failed to rise, they have begun to weaken again. 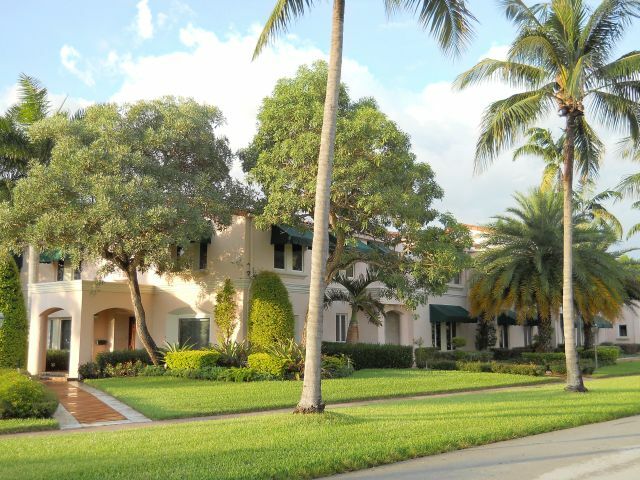 The sale of 2525 Indian Mound Trail, near the Biltmore Hotel in Coral Gables, was recorded recently at a price of $1,720,000. The house is 10,646 square feet, which means the buyer paid just under $162 per square foot for a luxury home in Coral Gables. Arguably, the interior spaces were more about size than style, but the price still brings to mind the uber-annoying Staples commercial (Wow, That’s a Low Price!). Doesn’t appear to have been a fire sale, either. 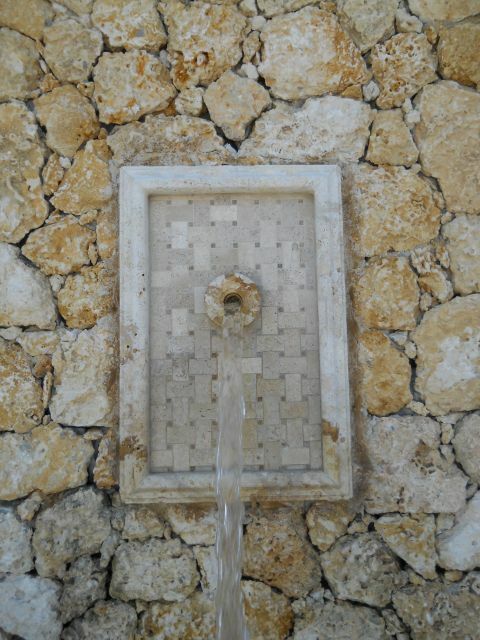 The house just sat on the market and was gradually reduced until a buyer was found. 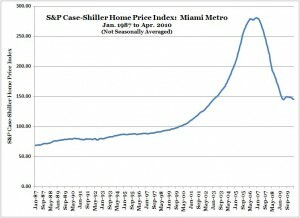 The S&P Case-Shiller Home Price Index, which tracks repeat sales of the same homes, continues to drift lower for the Miami metro area. The chart below is based on the non-seasonally-adjusted data set. Ordinarily, seasonally adjusted numbers might be more desirable, but these are not ordinary times. Show me the money. As a result, the mix of homes sold may be shifting from the low end toward the high end, giving a boost to the median price (i.e., the price at which the same number of houses sold for more as for less). Indices that track repeat sales of the same homes, however, show continued weakness as the prices of higher-end and luxury homes fall. Anecdotally, there have been some very significant sales and price reductions suggesting that property values are indeed falling at the higher end in Miami and Coral Gables. 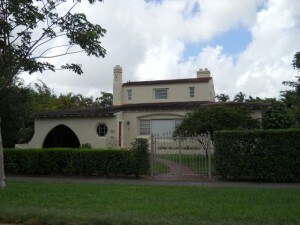 This recent sale in Coral Gables may be challenging for potential home buyers and their agents to understand. At 5,405 square feet according to public records, 909 North Greenway might seem to have sold recently for an inordinately low price at $842,500. That’s just shy of $156/sf. Indeed, it was cheap, even considering the need for some serious updating. But the key to understanding the price is that a big portion of the square footage –over 2,000 square feet according to public records — is in a second building out back that houses a couple of apartment units. That might be great for an extended family that wants a compound, or for someone who wants rental income. But it’s not for everyone. The main house is just over 3,000 square feet. And the master bedroom and bathroom were both tiny. Typical of many of the older two-story homes in Coral Gables, the second story has a much smaller footprint than the first. Sometimes there’s nothing but a single bedroom upstairs (here there were three, but with a pint-sized master). Property taxes and homeowner’s insurance are additional factors when considering a property like this. All that extra square footage in the thing out back might be nice, but you’d better really want it, because you’re going to pay for it whether you want it or not. Property taxes are about $20,000. Insurance would be about $15,000 to $25,000, depending on the carrier and coverage limits. And remember, insurance is not tax-deductible. For those uninitiated to home ownership in South Florida, the carrying costs can be quite shocking.